There are some words you are almost guaranteed to hear when you are an insurance customer. It doesn’t hurt to brush up on these terms so you can better understand them when discussing your insurance options with your agent. 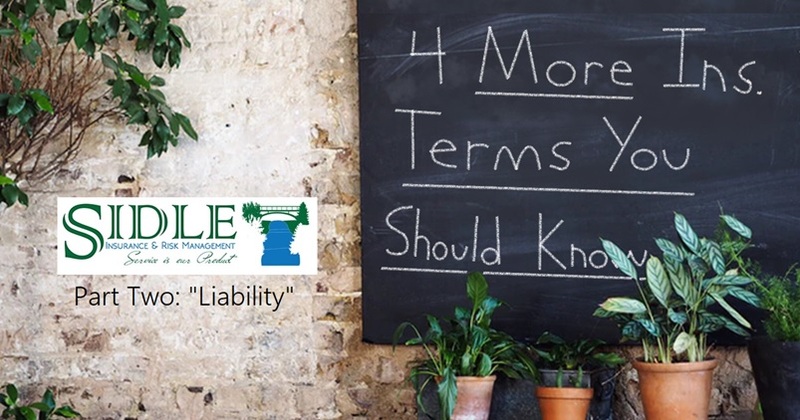 That’s why we’re continuing our blog series about insurance vocab today with Part 2 of “4 MORE Insurance Terms You Should Know”. This week’s insurance term is “Liability”. Liability is any legally enforceable obligation. Within the context of insurance, it is the obligation to pay a monetary award for injury or damage caused by one's negligent or statutorily prohibited action. In English, it is the requirement for someone to pay money to someone else to make up for harm that they caused or could have prevented. Situations can arise where liability is a serious concern. We run into potential risk every day and it seems like lawsuits are coming from all angles these days. If the court finds you liable for some kind of harm, you may owe someone a scary amount of money. What happens if you cause an accident on your drive to work one morning? Or someone gets hurt the next time you have guests over? These are obvious situations where you could be sued, but lawsuits can erupt from issues you aren't even aware of. What if your child bullies another kid? Or if a family member posts something online that offends somebody else? This is why we need to protect ourselves financially from what could happen. Liability insurance is one of the simplest ways to do that. It is intended to protect your assets… those you have now (and have worked hard for), and those that you will have in the future. If you have the right liability insurance and you get sued, the insurance company will provide a lawyer. If you lose the case (the court finds you negligent), the company will then pay the other party what the court says you owe on your behalf (up to the limit that you’ve purchased). If what you owe exceeds the limit of the liability insurance you’ve purchased, you will still owe the remainder after your insurance company pays out. So be cautious, some insurance retailers will sell you minimum limit policies. In New York State, the minimum liability limit for auto insurance is only $25,000. Between vehicle damages, hospital bills and possibly even court fees, that’s often not nearly enough. They do this to provide cheap rates, but those savings won't help you if something should actually happen. Similarly, sources for homeowners insurance may try to sell you the base limit of $100,000 in liability coverage. Again, should someone get hurt and you find yourself paying out as a result of a lawsuit, even $100,000 could still leave a hefty bill for you to have to pay out of pocket. Even more often they pay no regard to personal injury liability (this is where you’ve hurt someone’s feelings or offended them). This can be especially troubling in today's world, where people are often on edge and can get upset even when you don't mean them any harm. This is why you should contact an insurance agency that you can trust to provide you with the best liability insurance options. They will prevent coverage gaps and should be able to help you in even the most costly claims. We can help! Give us a call at (607) 535-6501 to learn more.